PORTEmaus: Newt to rest of GOP candidates: "You are Hurting my Feelings. Quit Being Meanies!" Newt to rest of GOP candidates: "You are Hurting my Feelings. Quit Being Meanies!" If the nauseating bombardment of jewelry and luxury car commercials are to be trusted (and they are! ), this is a joyous time of year. Stocking caps are donned, hugs are given to strangers, in short, man loves his fellow man. However, as Iowans prepare to cast the first ballot in the primaries on January 3rd, it seems that the all of the Republican candidates have not received the message of those Christmas commercials and this makes a tear form in the eye of Newt "The Amphibian" Gingrich. Why so said, buddy? It seems that Newt, a twenty-year veteran of the American political scene is ignorant of the negative nature of politics. In particular, the former speaker of the House admits that the negative position taken by his opponents are "taking their toll." I am speechless at what I am going to perceive as Newt's naivety to presidential politicking. What did he honestly expect to happen once he was at the top of the proverbial heap? Especially, when you consider that his consulting firm received a nice check from Freddie Mac. I guess he thought it would be smooth sailing and that he would be made the Republican candidate for president before a primary vote was held. I speak from experience when I say that politics is a nasty business. When I ran for treasurer of the six grade, it was a negative affair. Words such as "nerd," "wuss" and "dooty head" were hurled my way. The debates were no better as my opponents attacked my opposition on "extending recess" and "shortening the school day." They called me the "establishment candidate" and questioned my ability to relate to my fellow classmates. Sure, the negativity hurt, yet I went gave my speech about managing the student council funds in a practical manner and ran a great last place campaign. While, it is apparent that the whole farce was a popularity contest, I sucked it up and did not complain about it when interviewed by the school paper. 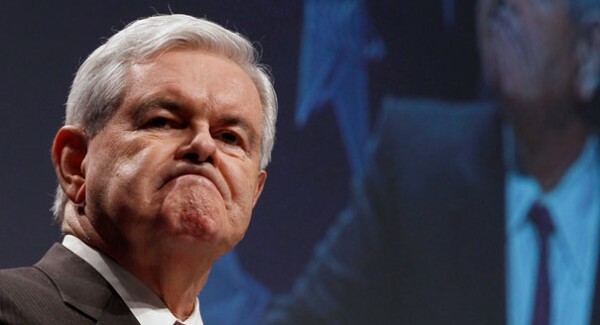 So, Newt, if you take anything from the tragic tale of twelve year old Manny Funkowitz, it is this: Man up and respond to the criticisms to your campaign or risk losing the election. As mentioned earlier, politics be its very nature is nasty and predicated on negativity. Hell, it makes the dull process of elections interesting. I do not know if your position of "not going negative" is genuine but you are going to "sully" your hands if you want to remain the front runner on the GOP side. In short, wipe the tears from your eye and quite being a wuss. Whoa, just had a flashback to the sixth grade. P.S. After all, it only gets worse from here on out and the Muckraker will not be wearing the "kids gloves" forever.